Fabulous Food Show full of awesome. I love to give stuff away. It makes me feel a little like Oprah. The good folks at the 8th Annual Fabulous Food Show *and* International Beerfest have given me a pair of tickets to giveaway! Oooo doggies. If you are anything like me and are a fan of the Food Network or cooking shows like Top Chef, this is it. This my friends, will be the place to be. I love, love, love, love LOVE Tom Colicchio. Not only is he the cool no shinnegans head judge on Top Chef, he is also the creator of the most delicious meal I have ever consumed in my entire life. More years than I will admit ago, I went to a wedding in Vegas. The reception was at Colicchio's craftsteak in the MGM Grand. It was a five course meal of the most amazing food I have ever chowed down. I remember wanting to take a fork home as a memento (no, I did not take it. I was preoccupied with my martini). If Tom doesn't pull you in, it has to be my favorite judge from Iron Chef and Chopped and new Iron Chef - Alex Guarnaschelli. She has a look that can strike fear into the heart of the toughest chef. I love it! 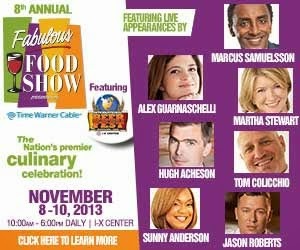 The Fabulous Food Show will be at the IX Center, November 8-10 from 10 am - 6 pm daily. Check out the website to find out where you can find your favorite celebrity chef. With over 450 exhibitors and 100 live demonstrations, there is something for everyone in the family! You can purchase single day or 3-day passes. General Admission tix are $25 and General Admission tix to the International Beer Fest Grand Tasting are $45. There are all sorts of other packages so check out more info here. Ok, now for the YAYYY! There are a couple of ways to enter to win tickets, so make sure you leave a separate comment for each method of entry. I let a computer program pick the winner, so if you don't comment, you lose an entry. Bummer for you if you don't follow directions. You can also tweet daily, but make sure you come back and leave a comment. 1. Leave a comment telling me which chef you are most excited to see. 2. Tweet the following: "I want to win a pair of tix to the @FabFoodShow from @clevelandchick! #Nom http://bit.ly/17venBe "
3. Follow the @Fabulous Food Show on the Twitter. 4. Like the Fabulous Food Show on the Facebook. 6. Follow @clevelandchick on the Twitter. You have until Saturday, November 2 at noon to enter. Remember, you can tweet once per day. Let's face it, if you tweet more than that, people will want to hurt both of us, so be cool. Disclosure: I was given a pair of tix for myself and a pair to giveaway to you fabulous foodie people. I'm so excited to go to this I am bouncing around like a puppy. All the words here are my own and currently fueled by way too much hazelnut coffee. Ahh Martha Stewart! I didn't even know she'd be there! Follow the food show on twitter! I follow @clevelandchic as @Tribechic on Twitter. I'm most excited to see Alex! Followed Fabulous Food Show on Twitter. I'm super excited to see Alex Guarnaschelli!! She's my fave! YOU WON! DM me your info on the Twitter. Thanks for entering! I'd like to see Martha! I'd love to see Martha! I follow the fabulous food show on facebook. Any since I can't cook. Alex & Tom! ok, and martha; she makes my event planner soul swoon. tweeted the following message"I want to win a pair of tix to the @FabFoodShow from @clevelandchick! #Nom http://bit.ly/17venBe"
liked the fabulous food show on fb! liked fab food show on facebook! No more comments. Thank you!